Hol Surf & Racquet 101-2BR☀OPEN Apr 27 to 30 $729!☀Ground Floor Patio by Beach! Top Reasons to Book this Condo! * Large Flatscreen TV in living room & Bedrooms! Holiday Surf and Racquet Club 101 has a wonderful porch perfect for enjoying evenings outside, and you are steps from the beach, just walk out your back door! This newly remodeled condo has two bedrooms and two baths. The master has a king bed, the second bedroom has two twin beds, and the all new furniture includes a queen sofa sleeper in the living room. The fully equipped kitchen, boogie boards and movies on hand are sure to please. Holiday Surf & Racquet Club is located directly on the beach in exclusive Holiday Isle, which is a peninsula surrounded by the Gulf of Mexico and Destin Harbor. With an elevator located in the lobby for your convenience, this destination is sure to please! Holiday Surf & Racquet Club has a heated pool, 2 lighted tennis courts, BBQ grilling area, shuffleboard, exercise rooms and saunas. There is free wifi in the lobby and pool areas. There are also coin operated Laundry facilities. The pool is pristine - the Holiday Surf and Racquet maintenance staff are State of Florida Certified Pool Operators and have received training to ensure the cleanest pool in this area year after year. In order to make your stay more affordable, NO beach service is provided. Beach service can be purchased from the front desk for around $30/day. Once you stay in Holiday Isle, you'll want to come back year after year! If you haven't been to Holiday Isle, you're in for a treat. It's a serene, little oasis in the middle of Destin, with 2 and a half miles of paved trails for walking and biking, surrounded by quiet neighborhoods perfect for exploring on a bike. It's just minutes away from restaurants, shopping, boat docks, fishing, golf, and amusements. An easy walk along the beach will take you to the jetties, where the Gulf of Mexico and Destin Harbor meet, a spot well-known for great snorkeling and fishing. Here you can also watch boats going out deep sea fishing and returning from gulf to harbor. 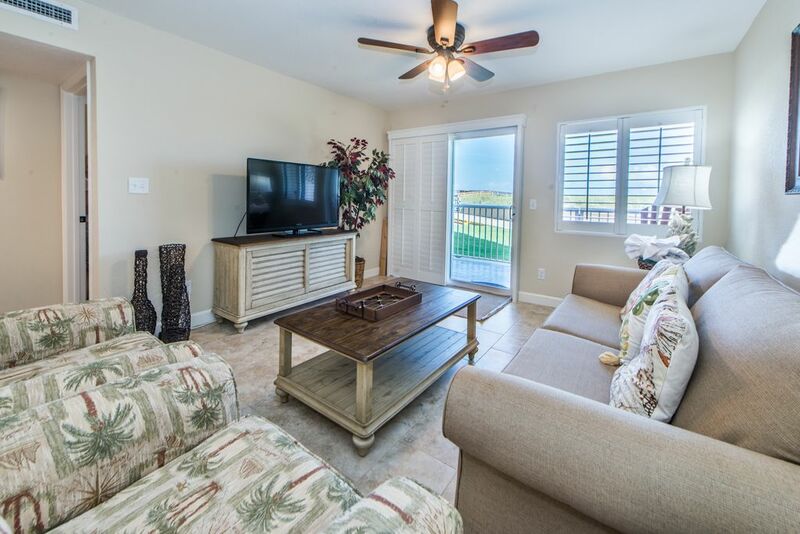 This property is located the closest to the beach in the complex...it is also within steps of the bridge that crosses over the dunes to the beach. Hi Michelle, thank you for your feedback on this great unit. We are sorry that it rained during your stay! We hope you enjoyed the Fitness Center & Sauna, and the walk straight to the beach from the porch. We value your input and thank you for choosing RealJoy! I love how we were right by the beach with easy access! Hi Kimber, thank you for your feedback on this lovely unit. We are happy you enjoyed being close to the beach and its' easy access! We appreciate your input and thank you for choosing RealJoy! Easy check in and check out. The unit was a GREAT location being first floor and within 50yrds of beach. The ability to park car outside front door was very nice as well. The unit is updated. Resort was as described. The rooms wertr very quiet at night. Only thing we wish unit had was a washer/dryer in the unit. The tennis courts need to be resurfaced. The pool was heated and perfect temp to swim. The beach was not crowded. The resort felt safe. Overall, we had a great time and enjoyed the rental. Hi Mark, thank you for your feedback on this lovely condo. We are pleased to see that you enjoyed being close to the beach, convenient parking, and the pool being comfortably heated. We appreciate your feedback, and hope you stay with RealJoy again soon! Loved being on the lower level within easy access to the pool and beach. With kids it makes things so much easier. The condo was so cute and perfect for our needs and we didn’t have any issues at all during our stay! Thanks for a great fall break vacation! Hi Amy, thank you for your feedback on your stay at this lovely condo. We’re happy to hear you enjoyed the easy beach access and pool and found the unit perfect for your family’s needs. Thank you again for your feedback and thank you for staying with Real Joy! The condo was great. It was the perfect size for my family. It was very clean and had all the the items we needed for a comfortable stay. The access to the beach and pool were perfect for us with small children. Hi Angie, thank you for your feedback regarding this lovely unit. We are pleased that you enjoyed the clean and well stocked condo, as well as the close access to the beach. We value your input, and want to thank you for staying with RealJoy! Everything was clean and well supplied. Loved the shuffleboard court and the closeness to the beach. We were on the first level so couldn't see the ocean from our place because of sand dunes blocking the view. Overall, enjoyed it very much! Hi Thomas, thank you for your feed back on this beautiful condo. We are glad that it was clean and fully stocked for your stay. It is such a perk to be so close to the beach! We value your input, and thank you for choosing RealJoy!